AirAsia, the truly Asean airline announced a brand new route connecting Luang Prabang in Laos directly to Kuala Lumpur, Malaysia with four times weekly flights commencing 21 November 2016. AirAsia is the first and only airline to operate direct flights from Luang Prabang to Kuala Lumpur. This will be the airline group’s 70th intra-Asean route connecting all ten Asean countries, as well as …. 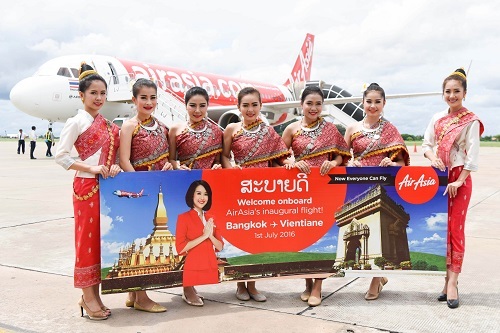 AirAsia, “World’s Best Low Cost Airline” 7 years running as ranked by Skytrax, began daily direct flights from Vientiane to Bangkok (Don Mueang Airport) of Thailand today (1 July) with an official press launch and a special promotional fare starting at only 35 USD per trip. Available for booking today to 3 July 2016 for travel from ….